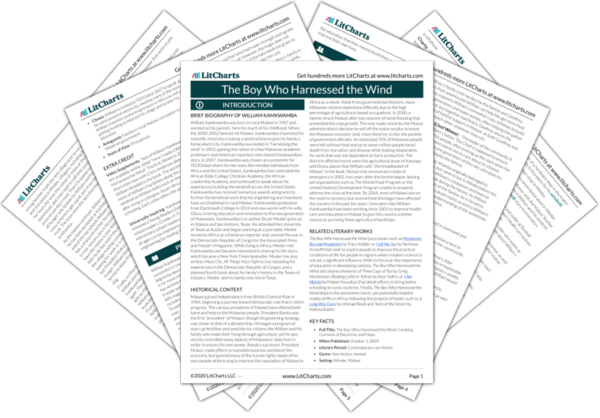 Instant downloads of all 946 LitChart PDFs (including The Boy Who Harnessed the Wind). 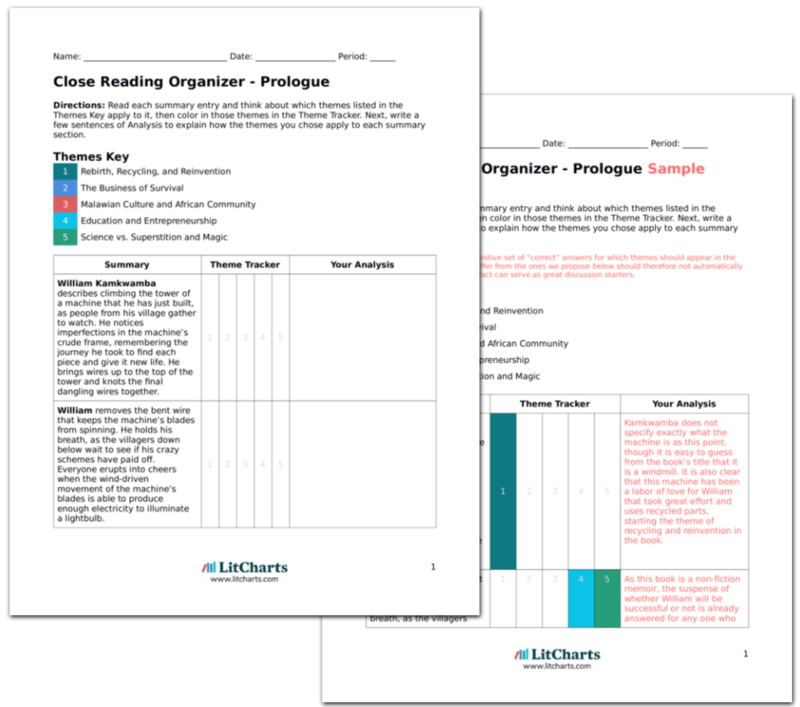 LitCharts assigns a color and icon to each theme in The Boy Who Harnessed the Wind, which you can use to track the themes throughout the work. As the new school term approaches, Trywell buys William new school supplies and William washes his uniform in preparation for a return to classes. The night before classes start, William worries whether his independent study was enough to keep him in line with the other students. Gilbert and William walk to Kachokolo together the next morning, and William enjoys seeing his old school friends – though some students are conspicuously absent after the famine. School holds a central role in William’s life, as he and his family are intensely concerned with William’s education. Though it is a place of learning, school is also a chance for William to get together with the other boys of his community. It offers a social aspect that helps bring the community back together after the often isolating hardship of the famine. William is woefully behind in many subjects and struggles to keep up for the next two weeks. After ten days, the grace period for paying school fees is nearly over and William worries because Trywell has not said anything about paying them. When Headmaster Phiri announces that students must pay last year’s fees as well as this year’s in order to continue with classes, William knows he won’t be able to afford it. Instead, William tries to sneak into class without paying by hiding in the latrine during the morning roll call and sitting in the back corner of class to listen and learn. Funding for school is a constant worry in William’s young life. The school system is unforgiving to those who can’t pay the fees, remembering debts of past years as well as the current fees. Thus the obstacles to gaining an education are even higher in rural areas where school attendance is interrupted for various reasons. William is far from the only student affect by the added fees, but he is one of the few who takes the initiative to bypass the fee and gain his education anyway. William attends school without paying for another two weeks before the teachers catch him without a receipt of payment. Trywell goes to the teacher, Mister Tembo, pleading with him to let William stay until they have the money. Surprisingly, Mister Tembo gives William three more weeks of school, so Trywell has time to raise funds by selling the tobacco crop. William enjoys his free weeks of school, but the tobacco crop is not as lucrative as expected due to the large number of deals Trywell struck during the famine. Once all the debts have been paid, Trywell is left with only enough for the family to live and eat. Though Trywell would like to appear self-sufficient and successful at all times to maintain his pride in the village, William’s schooling is important enough that Trywell will resort to begging the teacher to let William stay until they have the money. But again, the demands of survival outweigh the cost of school fees – no matter how dearly both Trywell and William would like to keep William in school. Trywell is devastated that he doesn’t have the money to send William to school, and the school cannot continue to let William go for free for fear of government inspections. For a daughter, the hope of a good marriage can provide a better life, but education is the only way for the sons of a farming family to aspire to something more than living at the mercy of the harvest. William knows that his future will bring nothing more than the business of survival as long as he is a farmer like his father. The government in Malawi takes an unforgiving stance on education, looking only at the monetary cost and not at the good it could do for its citizens. This is especially troubling for William because a lack of education means he has little chance of making a better life for himself. Men in Malawi are expected to provide for themselves and their families, so without further education William’s options are extremely limited. William has no time to mourn the loss of school, as the harvest comes and Trywell needs help bringing in the maize crop. Though disappointed, William is satisfied to see all the bitter work during the famine pay off. It’s the best crop the Kamkwamba family has seen in years and the storehouse is full of grain. Now that they are all putting on weight, the Kamkwambas laugh about how skinny they had all been. Work on the farm keeps William physically busy, but it does not give him the mental stimulation he craves. After the famine the Kamkwambas’ natural optimism and sense of humor return, such that they are even able to joke about the horror of the threat of starvation. When the harvest is over, William returns to his windmill project. He takes home tons of interesting pieces of machinery from the scrap yard and puzzles over their functions. Additionally, William asks Trywell if he can use the broken bicycle that Trywell has kept in the living room for months, waiting for the funds to repair it. Trywell doesn’t want to waste a bicycle on a silly project, but finally agrees when William explains that his windmill could give the Kamkwambas a second harvest each year. William’s room begins to look like a scrap heap, and he refuses to let his sisters clean it for fear they will throw out something important. Without school and the farm keeping him busy, William remains self-disciplined enough to challenge himself with the windmill project. He also manages to persuade his father to believe in his dream, giving William the emotional and material support he needs to keep going. William becomes obsessed with the windmill, to the point where almost all of his waking time is spent pursuing pieces for it – displaying a common trait among engineers of keeping any piece that looks remotely useful. Despite his unorthodox beginning, William fits in easily with the life of an inventor. William spends all his time on the windmill, much to the chagrin of his sisters, who have to go to primary school and work in the house all day. The windmill and the scrap yard begin to replace school in William’s mind, as he goes to the library again and again to review the books on electricity and currents. He spends days in the scrap yard pretending to be a famous mechanic. Once formal schooling is no longer an option, William fills in those gaps for himself with the hands-on experience he gets in the scrap yard and the theoretical foundation he gets in the library. These two things come together to help William keep moving toward his dream of becoming more than a farmer, as when he pretends to be a famous mechanic. Though William is happy spending days learning about machinery in the scrap yard, the villagers begin to gossip that William has gone crazy digging through garbage. With Geoffrey away working with Uncle Musaiwale, Gilbert is William’s only supporter. Even Agnes begins to worry that William will never have a normal life, through Trywell defends William’s project. William has enough support between his friends and his father that he can ignore the grumblings of the villagers and keep going with his project. Yet Kamkwamba looks back on this time with dismay that the very people he wanted to help with his inventions, such as his mother, did not believe in his abilities when he first started working toward his dream. After pounding flat more PVC pipe and shaping the plastic into blades, William now needs nuts and bolts to connect the blades to the rotor. Gilbert steps in and buys William a fresh bag of nuts and bolts when all the scrap yard bolts are too rusted to use. William earns 200 kwacha working ganyu and is able to pay a welder, Mister Godsten, to weld together his shock absorber and bicycle sprocket, as well as melt holes in the tractor fan rotor for the plastic blades. Mister Godsten calls William crazy, but eventually agrees to do the job. Though William finds pieces through recycling other materials and reusing old machines as often as possible, there are some instances when he truly needs new supplies. These junctures show the importance of outside support, providing William with things like quality nuts and bolts when he cannot find these things for himself. Though Gilbert is whole-heartedly committed to helping William achieve his dream, others in the village are still skeptical. William now has all the windmill pieces in place except a generator. With no money to buy a bicycle dynamo from Daud, William decides to build his own AC generator using magnets made from nails and wire. It is hard to find wire in the scrap yard, as other boys strip the old motors of wire so that they can shape wire cars for toys. William remains unflaggingly committed to his goal, even when it seems as though the parts that he needs are impossible to obtain. Other children in the village also make toys by recycling other products, but they do not have William’s vision or drive to achieve more with an invention. A month later, William still has nothing for a generator and complains to Gilbert that his windmill dream will never come true. Just then, a young man on a bicycle rides by with a dynamo attached to the back wheel. Gilbert buys the dynamo from the boy for 200 kwacha and gives it to William. William thanks Gilbert over and over, then runs home and places the prized dynamo next to all of his waiting windmill pieces. William’s hard work and ingenuity are crucial to his success, but creating the windmill also depends on William receiving help at the right times. Gilbert is often the source of the very thing that William needs, showing how William leans on his friends and collaborates with people to make an invention that will eventually help his entire community. This windmill may be William’s idea, but it is a shared effort to build it. Mueller, Bethany. "The Boy Who Harnessed the Wind Chapter 10." LitCharts. LitCharts LLC, 21 Jun 2017. Web. 23 Apr 2019. Mueller, Bethany. "The Boy Who Harnessed the Wind Chapter 10." LitCharts LLC, June 21, 2017. 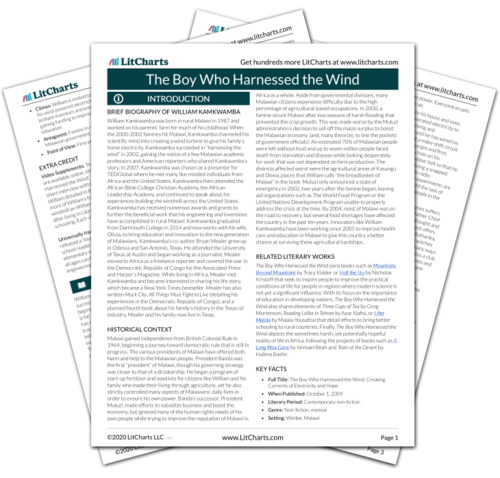 Retrieved April 23, 2019. https://www.litcharts.com/lit/the-boy-who-harnessed-the-wind/chapter-10.